The DiaEx Diamond Exchange is what the diamond industry is eagerly waiting for. It is really no surprise as, the features and functionality of this comprehensive diamond exchange, were discussed and debated with industry stalwarts months before the GLITZKOIN diamond blockchain idea was conceptualized. Back to the Diamond Price Estimator (DPE) and its role in the project. It might not be wrong to say that the DPE module is a prelude to the larger, objective of launching the much awaited DiaEx diamond exchange. Having said that, the fact is that the utility of the diamond estimator goes beyond, GLITZKOIN and beyond the DiaEx exchange. 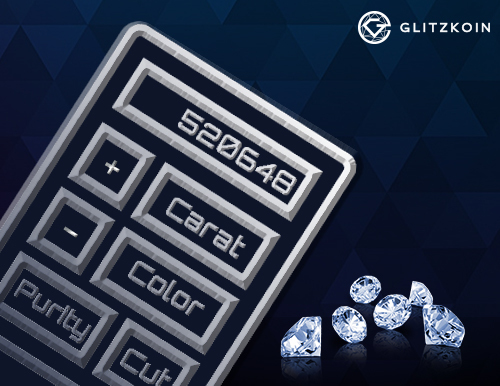 Putting the DPE concept in a nutshell we could say that, the diamond price estimator uses industry standard pricing charts to estimate the price of a diamond. It should be mentioned that, the accuracy of this estimate would be within +/- 20%. Considering that diamonds are creations of nature and that, no two diamonds are identical, the +/- 20% margin is very understandable. Viewed strictly from the viewpoint of the DiaEx diamond exchange, the price estimator would allow a buyer or seller to estimate, the market price of a diamond that he or she, wishes to sell or buy. A seller who lists a diamond at a price that is way above, the estimated price, might find fewer prospective buyers. A buyer, could check the estimated market price of a diamond that, he or she is interested in buying. A look at the larger role that the DPE Diamond Price Estimator could play, this beyond the DiaEx Diamond Exchange. A person holding a diamond either as a loose stone or set in a glittering jewel, could use the price estimator to get an idea of the current market price of the stone. It is quite possible that the related diamond was purchased, years or decades ago. It is not uncommon for diamond jewelry to be passed down, from generation to generation. Interestingly, these would be cases where the individual, has little or no technical knowledge about diamonds. The unbiased price estimate of the DiaEx estimator, would be invaluable in these cases. As is evident from the above report, the utility of the Diamond Price Estimator extends far beyond the GLITZKOIN project. Users of the DPE are not obliged to make a purchase or sale on the DiaEx Diamond Exchange.